Hunters are known to use hunting tree stands to suspend them in trees so they can better stalk their quarry, unseen. 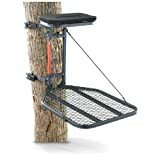 A hunting tree stand are platforms attached to trees, and they can be open-air or enclosed. The vantage point that these platforms allows for better shots at animals being hunted by hunters, such as whitetail deer. Hunters have a lot of options when it comes to hunting tree stands, as there are several different types of them. 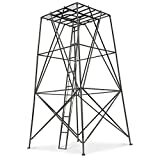 Climbing stands are made of two separate parts. There is a bottom part, and a top part. The bottom part is designed for standing, and the top part is created so the hunter can sit on it. Some top parts have backs to the seat areas while others do not. The two parts are typically connected by a strap mechanism, to prevent the bottom from falling all the way to the ground in the event it becomes loose, leaving the hunter in the tree with no way to get down. This stand can only be used with trees that have no limbs up to the height of where the hunter would be perched. There are several different styles to choose from, connecting to the tree in different ways. The part of the stand connecting to the tree itself can be made of a boomerang shaped piece of metal, or a thick cable. These stands are identical to ladder stands, except they don’t have a ladder in place. Hanging stands are stationary. These stands are connected to trees by cables or by chains at the height chosen by the hunter. To climb hanging stands, hunters use steps screwed into the base of the trees, or sections of ladders known as “climbing sticks” to ascend into the stand and get back down. 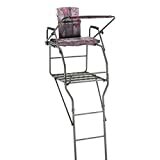 Ladder stands feature a standing platform with a seat while also sporting a ladder to climb up and down into the stand. In these stands, the ladder will detach from the standing platform to allow access to the stand. Ladder stands are stationary, as they cause too much noise to transport through wooded areas quietly, which would scare off the local game in the process. There are one and two-person ladder stands available, typically. A box stand is an elevated, enclosed “hunting blind” style hunting stand. These stands are usually large and shaped like sheds almost. Many are used for deer stands. Steps or ladders can be used to climb in or back down from the stands. These stands will help hunters both receive shelter from the weather and to hide them from the game they are hunting. Many box stand designs are made from plywood walls, different types of flooring, and metal or wood roofs. Some are even heated with portable heaters, and even outfitted with various other amenities. When you are preparing to hunt, you will need to take a lot of things into consideration, and the best hunters are well-equipped and know exactly what they are doing. If you are considering hunting tree stands, think about the needs you are addressing, such as which animals you are hunting (including big game), do you need visual cover, or do you need to be upwind of your quarry, etc. Evaluate the features of the available choices in hunting tree stands and match them with your needs to select what fits most closely. Careful selection will provide you with the solution you need when it comes time to get out in the great outdoors and hunt.